The Olympic 1980 begun some early…Yet on 26 April Daniela Nenova made 4064 points in Sofia. Two weeks later she improved to 4138 (14.81; 12.00; 1.69; 5.89; 2:15.9)… Emilia Kunova also proved in first test – 4196 (14.14; 12.15; 1.72; 5.72; 2:15.9) in Sofia on 23 May. At XXXIX Balkaniade in Sofia the Pentathlon was held for the first day – 13 June. Valentina Dimitrova began well – 14.22, behind the Romanians Corina Tifrea 14.03 and Coculeana Bucataru 14.21 and ahead of Daniela Nenova 14.44. Second event was precise for Valentina – 15.80 and the others were well behind – Nenova 12.58, Bucataru 12.35 and Tifrea 12.04. At HJ Dimitrova jumped very high – 1.86 (!!!) and Nenova also made pb – 1.80. Tifrea couldn’t jump higher than 1.77 and Bucataru left with only 1.65.. Fourth event again brought pb for Dimitrova – 6.20 m. Tifrea wrote 6.08. Bucataru (5.82) and Nenova (5.78) on their side were not able to reach the first two. At the last – 800 m – Dimitrova led after the first 600 m, but Nenova made a brilliant sprint at the home at won – 2:16.1, second Valentina achieved 2:16.4, third was Corina Tifrea 2:18.0 and fourth Bucataru 2:19.99. So the finals core were: Dimitrova with NR 4650 points, second Tifrea 4325, third with 4295 (pb) was Nenova, and fourth left Coculeana Bucataru 4123…. At Bulgarian Combined Champs in Sofia on 04-05 July Valentina Dimitrova did not start. A week before she injured herself at HJ (trying 1.83) in Pentathlon (14.57; 15.56; 1.80)….. Her absence inspired Emilia Kunova with huge pb 4437 (13.42; 13.25; 1.75; 5.91; 2:16.8). Had she leaped at LJ over 6.10 (completely of her abilities) she would have scored over 4500!!!! Second was future 100 m hurdles world No 1 Yordanka Donkova 4331 (13.24; 12.06; 1.70; 6.07; 2:20.4) and third Daniela Nenova 4219 (14.65; 12,75; 1.70; 5.95; 2:16.4)….. So for the Moscow Olympiade were selected only Dimitrova and Kunova. At XXII Olympiade in Moscow the Pentathlon was scheduled only in one day – 24 July. Emilia Kunova was due to start in first heat of 100 m hurdles. The winner was Nadezhda Tkachenko 13.29, second – Kunova 13.73 and third – Burglinde Pollak 13.74. In third heat Valentina Dimitrova heated the second hurdles very badly and almost fell…. Anyway she completed the dash in a last seventh place with mediocre 14.39. Second event – Shot putting – has scheduled in two groups. In first Group A Dimitrova made 15.65 (third after Tkachenko 16.84 and Pollak 16.67). In Group B Kunova achieved only 11.98 (instead of usual 13.00). At HJ Dimitrova felt sharp pain in her heel and managed to take only 1.74. The same height did in Second Group B Emilia Kunova (1.74). Long Jump was scheduled for 17:10 p.m. in the afternoon. Both Kunova and Dimitrova were “taken” in first group A. Kunova leaped 6.10 and 6.03 before fouling a good jump at third try – it was obvious that Emilia landed over the 6.20 mark…But unsuccessful! Dimitrova fouled in first jump, in second wrote 5.91….. In third try Valentina jeopardized – all or nothing and jumped of around 6.10 m. But faul was announced again… The last event 800 m has scheduled for 20:55 p.m. Valentina Dimitrova led after first lap, but Emilia Kunova urged at the last curve and flied ahead. She crossed the line with good pb – 2:11.10, ahead of Dimitrova 2:15.50 and the French Florence Picaud 2:16.70… The placings of Bulgarians were – seventh Valentina Dimitrova with 4458 and eighth Emilia Kunova with 4431, only six points below her personal best…. Meanwhile in Pleven on 12 July Venet Simeonova overwhelmed 4000 poins scoring 4019 (14.7; 11.16; 1.65; 6.07; 2:22.0)…. The Pentathlon was replaced by Heptathlon in women’s program. The first Bulgarian record holder became Daniela Nenova – in Sofia on 16-17 May she scored initial 5418 (14.46; 11.60; 1.72; 25.41/ 5.55; 29.00; 2:18.18). Three Bulgarians flied to Götzis next week (23-24 May) for HypoBank meeting. It was on 23-24 May….Valentina Dimitrova made NR with 5682 (15.22; 14.67; 1.71; 26.09/ 5.86; 36.68; 2:19.66) for ninth place! Daniela Nenova took 5566 (14.66; 11.47; 1.71; 25.21/5.89; 27.42; 2:12.57) for 16th place. Her 800 m mark (2:12.57) was the best among the 20 athletes. Yordanka Donkova gathered 5141 points (13.93; 11.13; 1.60; 25.10/ 5.66; 23.32; 2:33.91). The record of Dimitrova lasted very shortly….Emilia Pencheva bettered it in Praha on 06-07 June with 5867 points (13.55; 13.35; 1.74; 24.78/ 6.01; 29.12; 2:19.23). Daniela Nenova erased quickly (!) that mark from record books – she scored 5948 points in Sopot (Pol) on 16-17 June (14.38; 12.73; 1.75; 24.88/ 6.32 (pb); 33.90; 2:12.97). Along with Emilia in Praha participated also Yordanka Donkova. She scored 5278 (13.87; 11.76; 1.68; 25.40/ 5.97; 25.12; 2:41.13). Three days later the answer of Emilia Kunova was elo`quent – once more new record 6030 (13.45; 12.80; 1.80; 24.02/ 6.10; 32.50; 2:20.30). Thus Kunova became the first Bulgarian that scored over 6000 points ever! The next important aim and task for Bulgarian women was to advance the team to the European Cup Combined events in Birmingham at the end of August. For implementing that task they had to go through the semifinal in Malmö on 11-12 July. And they did it!!!! Daniela Nenova was sixth 5768 (14.55; 12.63; 1.78; 25.77/ 5.90; 32.54; 2:12.47). Valentina Dimitrova placed eighth 5620 (15.18; 14.35; 1.75; 26.59. 5.59; 37.44; 2:19.61). And Emilia Kunova-Pencheva (married in winter pole vaulter Stanimir Penchev 5.70) placed ninth 5454 (14.37; 11.96; 1.72; 26.60/ 5.60; 34.54; 2:22.97). Yordanka Donkova herself remained below herself with 5140 (14.07; 11.33; 1.72; 25.62/ 5.78; 21.68; 2:40.27)…. Meanwhile young prodigy Tatyana Stoycheva (only 18 years old) was preparing for the European Junior Champs in Utrecht at the end of August. In Pleven on 05 July Tatyana scored 5566 (13.6; 12.38; 1.55; 25.3/6.10; 39.76; 2:20.1). Stoycheva became Balkan Junior Champion (again in Pleven) on 25-26 July with 5809 (13.77; 13.00; 1.55; 25.65/ 6.05; 43.16; 2:16.81)….Second here was another young Bulgarian – Mariana Dimitrova with 5377 (14.46; 13.28; 1.58; 26.64/ 5.39; 45.96; 2:34.28). And third placed – Nikolina Miteva 5278 (14.98; 12.34; 1.61; 26.64/ 5.41; 38.02; 2:24.94). Daniela Nenova flied to Bucuresti for participating at Univerisade. She competed bravely. After mediocre 14.64 at 100 m hurdles and 11.71 at SP Nenova achieved brilliant 1.85 m at HJ (along with Malgrzata Guzowska-Nowak (Pol), Birgit Dressel (FRG)) and only Judy Livermore (Gbr) was higher with 1.88). But after that Daniela could not continiue in the same manner. With weak 26.38 at 200 m, only 5.64 at LJ and 33.02 at JT she was far behind the favorites. Bursting in 2:15.15 at 800 m Nenova could score only 5695 for eighth place overall. Tatyana Stoycheva went to Holland (Utrecht) where she took part at Heptathlon of the VIth European Junior Champs. At first event – 100 m hurdles – Stoycheva achieved pb – 13.76. No other of the rest 15 contenders could even come down under 14 seconds (the second best was Britain Sarah Rowe with 14.21. At SP Tatyana made not good 12.39. She has had never been mighty at HJ. This time was the same - she remained satisfied with her “usual” 1.55 m. At 200 m Stoycheva bettered her pb with 25.24. At the beginning of second day the thing were seem to be in danger for Tatyana. She began with two fouls at LJ. At last in third try she secured herself with modest 5.89 m…. The javelin was relatively good – 41.62…. Before last event Stoychgeva hold the third position for the bronze (before soviet Olga Abramova and Britain Sarah Rowe). Tatyana struggled with all of her remaining energy to save the bronze. Yet but Britain Sara Rowe run well ahead and increased the gap more and more…. Tatyana gave all of her once more and finished third for 2:15.79… First finished Rowe with 2:10.91, second Ilona Dietze (GDR) 2:14.30… Behind Tatyana arrived eventual winner Anke Tröger (GDR) 2:16.28….Stoycheva waited anxiously for the final scores. She looked at once on the score screen. Champion became Troger with 6032, second – Ilona Dietze with 5991 and third – oh yes – third was Tatyana Stoycheva with 5764 points, only trifling 21 (!) points ahead of Britain Sarah Rowe….What a brave & inspired participation!!! The European Cup in Combined Events for 1981 held at 29-30 August in Birmingham…. Bulgarian women filed to there concurrent and cohesive…. Although the Daniela Nenova’s injury took her in the bottom at the end and she cpouldn’t help much the team…. At first event – 100 m hurdles – Emilia Pencheva ended third in fourth heat with 13.87 (-1.4), behind Ramona Neubert (GDR) 13.66 and Sabine Everts (FRG) 13.74, but ahead of Nataliya Korotyaeva 13.89. In second heat Valentina Dimitrova was also third 14.81 (-1.6) after Ute Rompf (FRG) 14.29 and Heidrun Geissler (GDR) 14.42, bur ahead of Nadezhda Vinogradova (URSS) 14.82… In third heat winner was Sabine Möbius 13.36 (-1.5), second Ekaterina Gordienko (URSS) 13.84 (-1.5), third (!) Galina Simeonova 14.26, ahead of Kathy Warren (Gbr) 14.38, Gabriella Bebesi (Hun 14.43 and Cornelia Sulek-Heinrich (FRG) 14.44. At second event – Shot putting – Valentina Dimitrova was the best with 15.19, second Ekaterina Gordienko 15.17 and third Ute Rompf (FRG) 14.96…Galina Simeonova set 11.78, and a fraction better was Pencheva with 12.17. At HJ Heidrun Geissler got 1.87 like no one else… West German Cornelia Sulek-Heinrich was second 1.81. Sabine Everts, Anke Vater-Behmer (GDR) and Emilia Pencheva cleared 1.78…..Well below were Galina Simeonova and Valia Dimitrova – each 1.64 only. At 200 m in fourth heat winner was Sabine Everts 23.62 (-0.7), followed by Ramona Neubert (GDR) 23.83, Vinogradova 24.30, Hungarian Erika Kosa 24.80, Britain Judy Livermore (with zero at SP) 25.05 and Emilia Pencheva 25.12. Galina Simeonova herself was sixth in third heat with 24.90 (-0.5), behind the winner Anke Vater-Behmer 24.03, Ute Rompf 24.22, Gordienko 24.38, Kathy Warren 24.77, Klara Novobaczky 24.89…Valentina Dimitrova ended the first day with weak 200 m 26.01… Second day continued in modest manner for ours…Pencheva almost leaped to six meters at LJ – 5.96, Dimitrova (5.73) and Simeonova (5.71) missed good opportunities. Only Heidrun Geisler 6.69 (pb), Ramona Neubert (6.51), Sabine Everts (6.38) and Anke Vater-Behmer (6.35) showed something relatively special. At Javelin throw the things weren’t changed for good….Dimitrova (35.98) and especially Simeonova 37.84 maintained their own hopes for the end, Pencheva with 32.80 saved the rest for best! Here over 40 meters threw only Ute Rompf 44.62 and Natalya Shubenkova 44.58…near stayed Neubert 39.96 and long jumpers Zsusza Vanyek 38.72 & Klara Novobaczky 38.12. Can Hungarians catch Bulgarian in battle for fourth place? 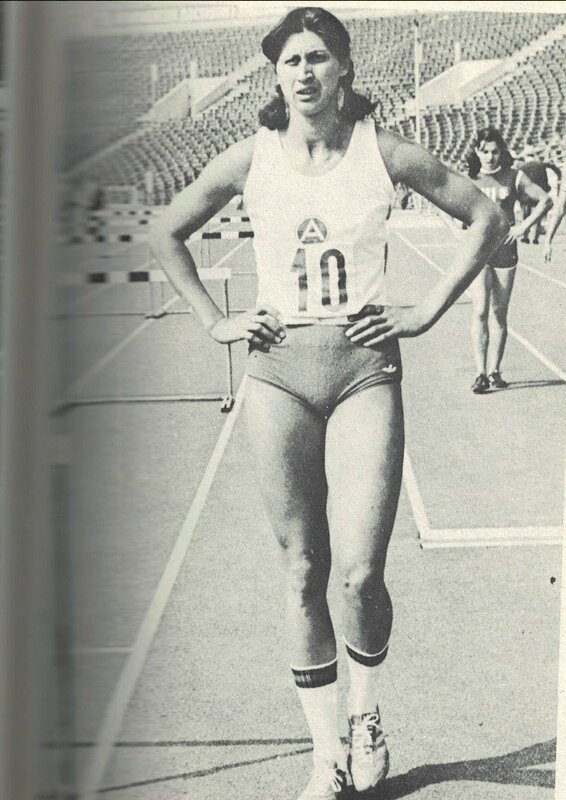 Our athletes were in second heat with soviet women… Before that Hungarian achieved in first heat: Novobaczky 2:16.05, Vanyek 2:19.58, Bebesi 2:21.45, Erika Kosa 2:26.06….Our girls fought with soviets with all their souls. Winner in the second heat became Galina Simeonova with 2:13.86, ahead of Natalya Shubenkova 2:14.95, third Gordienko 2:15.03, fourth Valentina Dimitrova 2:15.04, fifth Pencheva 2:15.05, sixth Korotyaeva 2:15.36, seventh Vinogradova 2:15.58 and eighth Nenova 2:16.70… Nice end of the battle – Bulgarian girls remained at fourth place – a pleasant and prestige standing….The team winner became GDR 18682, ahead of FRG 17817, URSS 17480, BULGARIA 16892, Hungary 16818 and Great Britain 16161…. Albeit the season final was still not reached. There was yet one test remaining – Balkaniade in Sarajevo on 18-19 September. Emilia Pencheva was steady and feisty to the gold medal in the duel with Romanian Corina Tifrea. Emilia commenced in good shape (13.88; 11.81; 1.71; 25.05). But at second day Tifrea leaped at 6.20 LJ (against only Pencheva’s 5.80). At Javelin Throw Pencheva made pb with 38.26… So 800 m run had to become crucial for gold. Emilia Pencheva (2:17.65) was better than Tifrea (2:19.23). And won the Balkan title with 5796 ahead of Corina Tifrea 5755. Third remained Galina Simeonova with 5701 (14.03; 12.10; 1.71; 25.21/ 5.72; 35.94; 2:19.42)…. Yet in winter (06-07 March in Sofia) Daniela Nenova & Tatyana Stoycheva showed their promising early shape, winning the Indoor Pentathlon title and silver respectively. Nenova finished first with 4434 (8.78; 12.20; 1.82; 5.77; 2:14.18), second ranked Soviet Natalya Shubenkova 4432 (only 2 points behind) (8.49; 12.54; 1.70; 5.98; 2:13.88), Stoycheva remained third with 4417 (8.51; 13.44; 1.64; 6.22; 2:18.26), fourth was Valentina Kurochkina 8.91; 12.66; 1.79; 6.03; 2:26.42)….. The summer season opened with 5884 of Valentina Dimitrova in Sofia on 29-30 May ((14,49; 15,28; 172; 25,58/ 575; 39,02; 2:17,99). A week later – in Praha on 05-06 June Daniela Nenova took second place at Heptathlon with 5510 points (14,95; 12,16; 184; 26,40/ 578; 31,20; 2:23,06). At Bulgarian Individual Combined Events Champ in Sofia on 03-04 July the coach Georgi Dimitrov confronted his alumni Valentina Dimitrova and Yordanka Donkova. Donkova started with Bulgarian record at 100 m hurdles – 12.65 (Dimitrova 14.23). At SP Dimitrova putted the steel ball to 15.68 and Donkova was behind with 13.05. At 200 m Donkova flew to 23.04, Dimitrova was well behind – 25.17. At the beginning of second day Donkova leaped 6.18; 6.35 and 6.39 in a raw. In her third attempt Yordanka couldn’t hit the take-off board – the real jump was of about 6.50 meters!!! Valentina Dimitrova made pb with 6.30 m….. At Javelin throw Donkova couldn’t rely of anything special…. The reason is – Yordanka is weak at throws. She has had lost three (of her five) fingers just on her fifth birthday. This time Donkova threw the 25.26. On her side Dimitrova achieved 40.56…. So Donkova almost lost her advance. At the last – 800 m – Dimitrova run inspired and finished with pb of 2:08.59…Dnkova was well behind with 2:18.71. So Valentina Dimitrova became champion with 6305 (NR), second completed Donkova with 6189, third was Tatyna Stoycheva with 5712 (14,16; 13,53; 155; 26,11/ 6.24; 41,12; 2:20,77). Exactly at the same time in Drama (Grece) was held Balkan Junior Champs. Nikolina Miteva became Balkan junior champion with 5616 (14.64; 13.22; 1.58; 25.56/ 5.58; 40.36; 2:16.15)…. Miteva became Bulgarian junior champion two weeks later with 5519 (15,16; 13,63; 155; 25,66/ 564; 39,66; 2:18,17), ahead of Galina Nikolova 5422 ((15,38; 12,31; 172; 25,67/ 571; 37,58; 2:30,70). Tatyana Stoycheva won silver medal at Women’s Balkaniade in Bucuresti on 13-14 August. She gathered the sum 5720 (14.08; 14.36; 1.55; 25.82/ 6.10; 37.10; 2:19.23), behind Corina Tifrea (Rou) 6080 points….. So Valentina Dimitrova departed to Athina for the European Championship on 09-10 September. She hurled herself bravely yet at first event – 100 m hurdles. Winner in third heat was Sabine Everts (FRG) 13.46 (-1.0), second Ramona Neubert 13.61, third soviet Lyudmila Kolyadina 13.94, fourth the Swede Annette Tanander 14.16, fifth Dimitrova 14.27 and sixth Zsuzsa Vanyek 14.27. At Shot Putting Valentina putted 15.20, third best after Kolyadina 16.04 and Anke Vater 15.26, but before Neubert 15.02… At HJ Dimitrova got 1.80 (along with Shubenkova (URSS), Florence Picaut (Fra) and Tanander…. The best there were Sabine Everts and Britain Judy Livermore with 1.89 each and three other completed with 1.83 – Neubert, Sabine Möbius and Anke Vater from GDR. Möbius was first in 200 m (second heat) with 23.71 (-0.7), second was Dutch Tineke Hidding 24.63, third Kolyadina 24.97. Hungarian Zsuzsa Vanyek edged Dimitrova for fourth place – 25.09 vs. 25.11 for Valentina. Next week - in Sofia on 05-06 June young prodigy (only 17-years old) Tatyana Tsvetkova Georgieva scored at first 5663 (14.84; 1.75; 12.09; 24.59/ 5.93; 28.90; 2:16.37)…..
Valentina Dimitrova was invited to take part at the Summer Spartakiade of URSS in Moscow on 18-19 June. At 100 m hurdles she almost reached her pb – 14.06….At HJ Valentina was magnificent – with best result among all heptathletes – 1.88 (!!!). Yet but when trying 1.91, she twisted her ankle and was forced to withdraw…So her result at SP was a meter below mark – 14.77. 200 m were so tough for Dimitrova – 24.76 with the pain in foot… Second day Valentina began with 6.24 (in her third attempt she landed on 6.40, but the soviet judge raised red flag… At JT Dimitrova threw 40.26… And at 800 m with 2:09.78 she fought against soviet Tatyana Shpak 2:06.87, the world record holder Ramona Neubert 2:07.51, Natalya Shubenkova 2:07.55, Olga Kuragina-Nemogaeva 2:08.79, Anke Vater 2:08.89…Dimitrova scored 6368 points for sixth place. Ramona Neubert took world record 6836, second was Shubenkova 6499, third Ekaterina Smirnova 6493, fourth Lyudmila Kolyadina 6485. Fifth completed Anke Vater 6412. Behind Valentina at seventh place rested Olga Nemogaeva 6298, eighth was Tatyana Shpak with 6296…. At Balkaniade in Ankara (Turkey) on 24-25 June Mariana Babova took bronze medal with pb of 5791 (13.93; 1.60; 12.55; 25.25/ 5.83; 42.58; 2:16.98)…. Tatyana Tsvetkova and Valeria Mitkova (both 17 years old) took gold and silver at Bulgarian Junior Champ in Sofia on 10-11 July . Tsvetkova gained 5961 (13.85; 1.67; 11.98; 24.23/ 6.10; 37.26; 2:12.80) ahead of Mitkova 5571 (14.28; 1.73; 10.54; 25.01/ 5.92; 27.96; 2:15.11)… Valeria Mitkova herself won silver medal at Balkaniade in Bucuresti on 30-31 July (14.03; 1.65; 9.84; 24.76/ 5.98; 25.92; 2:15.96). Third with bronze completed Boryana Tsolova 5363 (15.11; 1.65; 10.56; 25.51/ 5.98; 30.16; 2:18.54)…. Bulgarian Combined Events Champ was held in Sofia on 23-24 July. Valentina Dimitrova became champion with 6283 (14.03; 1.78; 16.03; 24.81/ 6.01; 41.34; 2:11.76), followed by Tatyana Stoycheva with pb of 6085 (13.64; 1.66; 14.35; 25.27/ 6.10; 40.96; 2:12.56). With bronze (only 2 points below) finished Daniela Nenova 6083 (13.45; 1.69; 13.46; 24.26/ 5.71; 35.28; 2:07.11). Nenova injured her left thigh when trying 1.72 at HJ. Her participation up to the ending was an anticlimax… Soon after it became obvious that Nenova will not be able (and healthy) to assist the team at the European Cup…. Fourth was Mariana Kostova-Babova with 5528. Tatyana Tsvetkova flied for Leningrad (Sankt Peterburg) for competing at “Druzhba” tournament on 10-11 August. There Tatyana performed brilliantly and scored only 10 points under her own pb to win the gold medal – 5951 (14.00; 1.68; 12.83; 23.97/ 6.02; 33.30; 2:12.30)…..
At the same time Valentina Dimitrova struggled at the First World Champs in athletics in Helsinki. The Pentathlon was scheduled for 08-09 Aug….At first event – 100 m hurdles Valentina Dimitrova was on her moment abilities – 14.21. Not bad…. Second event – 1.80 m with ankle pain And some ice on her foot….Third event – Shot putting. Dimitrova was in Group B and gained the victory with best result out of all 26 competitors – 15.67. Ramona Neubert was the only other to putt the steel ball over 15 m – 15.38. At 200 m Dimitrova could run no faster than 25.08… Second day. At Long jump Valentina began terribly – 5.62, following with two relatively good leaps – 6.10 and 6.11. Albeit perhaps she could add at least about 15 sm more? At the sand pit Sabine Möbius (6.68) and Ramona Neubert (6.67) was far ahead of Sabine Everts (6.46). Dimitrova achieved pb at Javelin throw – 44.60 to place fourth in Group A after Ekaterina Smirnova 45.76, Jane Frederick 45.62 and Ramona Neubert 45.12. Valia beat Sabine Paetz (44.52)… In Group B the best were Corinne Schneider (Sui) 46.22) and Annette Schneider (Swe) 45.24… And the last 800 m were yet to come. Valentina was a real fighter (as always she used to be) and go bravely at the head of column….. East german Anke Vater went ahead and won eventually with 2:05.64… Sabine Everts (FRG) edged Dimitrova in a closing stages taking second place with 2:06.80. Third finished Valentina with another pb – 2:08.10…..The final standings were: 1. Ramona Neubert 6714, Sabine Paetz 6662, 3.Anke Vater 6532, 4.Sabine Everts 6398…at fifth place ranked Valentina Dimitrova!!!! – her score was 6362, ahead of Ekaterina Smirnova 6321, future Olympic champion Glynis Nun (aus) 6195….Could Dimitrova catch Everts for fourth place?.... Probably? Four days later in Sofia another contest for the places in national team for EC was held. Tatyana Stoycheva won with 6018 (13.73; 1.65; 14.19; 25.06/ 6.26; 38.66; 2:15.50), followed by Galina Simeonova-Bakhchevanova 5904 (13.92; 1.67; 12.28; 24.89/ 6.08; 38.24; 2:14.00), Valia Vasileva 5774 (14.24; 1.73; 12.66; 25.35/ 5.70; 38.10; 2:17.24). At fourth finished Mariana Kostova-Babova with 5620. Fifth and sixth performing personal bests placed Mariana Nakova 5477 and Ivanka Valkova 5469…. Tatyana Tsvetkova had to compete at European Junior Champ in Schwechat on 27-28 August. That had to be her fifth Pentathlon for the 1983 year. Tsvetkova Georgieva felt not in good shape – some exhausted and unconcentrated… She began with usual 14.23 at 100 m hurdles. After that Tania made a pb at HJ – 1.75 and a was little below at SP – 12.17…..200 m were a little bit slow for Tatyana – only 24.63 (an that in case she had has had 23.85!!!). Second day commenced with modest 5.82 at LJ. After a relatively satisfying 37.76 at Javelin, at 800 m Tsvetkova Georgieva gave all of her and with 2:14.82 stayed second – only GDR girl Jana Sobotka was ahead 2:12.98……For regret Tatyana missed so much at 200 m and LJ and it was impossible to reach the medals – after all maybe she deserved that. Euroepan champion with world record became Sibylle Thiele 6421, second Sabine Braun (FRG) 6273, third Jana Sobotka 6222, fourth was West German Helga Nusko with 5937 points….. In second event – HJ – GDR Kristine Nitzsche was best of all with 1.90 and Livermore with 1.87 was second. Three succeed at 1.84 – Smirnova, Geisller, and West German Birgit Dressel. Other three made 1.81 – Kim Hagger, Sibylle Thiele and Sabine Everts. At the Height of 1.75 bulgarian Yordanka Donkova hit her head at the left side pillar. She rived her eyebraw and the blood spouted on her face and breast…The doctor stopped the blood and Donkova succeed at her second attempt at 1.75. After that she got 1.78 to equal her pb….. Valentina Dimitrova also made 1.78, but failed at 1.81. And that when the odds waited something special of about 1.81 – 1.84 from her! At second Group B Galina Simeonova-Bakhchevanova took 1.75 for pb, but Tatyana Stoycheva rested with 1.60…. Third event – Shot putting – in Group A Valentina Dimitrova made huge pb at once – 16.45. In Group B Nitzsche putted the shot to 16.10…Kolyadina was third 15.64 and Smirnova 15.20…. Ramona Neubert putted well – 15.21… At the noon pause Yordanka Donkova drived to hospital to stitch her eyebrow and return to stadium to put the shot in good manner for 12.80….The other two Bulgarian – Galina Bakhchevanova (12.11) and especially Tatyana Stoycheva (after two fouls only 11.13) were unfocused and couldn’t help the team much. GDR ranked ahead after third event – 8560, URSS 8422 second and third Bulgaria 8287. Fourth event – 200 m. Winner of first heat became soviet Nadezhda Vinogradova 23.69, second Nitzsche 24.28 and third Bakhchevanova 24.83. In second heat Valentina Kurochkina got the victory – 24.82, followed by Tatyana Stoycheva 25.01… Third heat was on lanes – Yordanka Donkova run perfectly ahead with excellent 23.25, well before Sibylle Thiele 24.67… The last fourth heat… Neubert won in good 23.52, second Sabine Everts 23.89, third Ekaterina Smirnova 24.50, fourth with pb of 24.59 finished Valentina Dimitrova, fifth was Judy Livermore 24.75… After first day GDR was ahead with 11331, second Bulgaria 11042 and third URSS 10985… A provocative detail was revealed at the evening. Valentina Kurochkina injured herself and was not able to go on… So every of the rest three soviet was due to complete Heptathlon. Otherwise (in case anyone of three failed) Soviet would lose any right for team placing…. Sixth even – Javelin Throw – was decisive for team rankings….Valentina Dimitrova after a foul in second try recorded 41.62 and her third attempt was also foul (of about 44 meters!!). Here in the same group Tatyana Stoycheva was so modest and hesitant (31.22; 29.82 and 30.98). And all that instead of “her” usual 40 meters during all season???? In Group A Galina Bakhchevanova began with 33.54 but after that remained inexplicably weak – with two consecutive no throws??? Yordanka Donkova was a good fighter – she made what she could – and threw 29.40 for personal best! GDR team continued leading after sixth trial – 16698. The soviet girls climbed to second place – 16084, hostesses went down to third place – 16000. What Bulgarians could do to return to second spot? Bulgarians were scheduled in second heat (in first run FRG and Hungarian teams) along with Britains….. Valentina Dimitrova run selflessly and won for 2:08.70, second Bakhchevanova 2:11.79, third Livermore 2:12.50, fourth Stoycheva 2:12.92, fifth Yordanka Donkova with pb 2:17.51…. In the third race lined up GDR and URSS teams. World record holder Neubert fought with soviet Vinogradova (2:05.72) and completed second with 2:06.70 (pb). Ekaterina Smirnova finished third for 2:13.91, fourth was Heidrun Geissler 2:15.93, sixth Nitzsche 2:20.16, seventh Thiele 2:20.52 and last Kolyadina 2:22.68….. Was it enough for Bulgarian to raise again to second place??? Yet on early May it was clear that Bulgarian sportsmen will not take part at XXIII Olympiade in Los Angeles. There were other ways to prove strength and determination for those (all socialist countries) who won’t become Olympians…. Valia Vasileva travelled to Götzis to take part at HypoBank meeting on 24-25 May. Her appearance is not known so far…. Long Jump was fifth event on second day (09 June). Lilyana Panayotova was “head and shoulders” above the rest. She leaped first two tries for 6.45 and 6.48 (-0.2) respectively. Third jump was for Panayotova a inspiration – she run jeopardizing - very fast at approaching and sprang off steadily. After a nice leap Lilyana landed at about 6.60 m, but (oooh, pity) it was declared as foul…. Second was Lyudmila Ninova 6.40 (-1.0)…Sabine Everts also began with mediocre 6.25 m (-0.7). After that she made two brave leaps, but both were fouls at around 6.50 m. The Swedish Annette Tannander 6.17, Sabine Braun 6.03, Emilia Pencheva 6.03 and Judy Simpson 6.03 stayed far below.. At Javelin Throw Bulgarians were very weak – Pencheva 34.40, Ninova 27.24 and Panayotova 22.54. What had to be expected if Panayotova and Ninova were acquitted with “Speer” just a couple of days ago… The West Germans went ahead – Sabine Braun made a brilliant hurling – 52.14 m, Helga Nusko 45.04, Birgit Clarius 44.14, Birgit Dressel 42,54, Annette Tannander 41.30, Bettina Beinhauer 40.52….Sabine Everts could throw a mediocre 31.18… The ultimate 800 m heat gathered the best. Sabine Braun lead until the last 30 meters where Sabine Everts edged her for win with 2:09.35. Braun was second with 2:09.41. Third finished Lilyana Panayotova with 2:09.56 (that was here first 800 run ever, she tried 400 m 54.17) . Dutch Marijan Wijsma almost cathed Panayotova but couldn’t do more – 2:09.60. Fifth was Birgit Clarius 2:09.98. Just behind them ended Emilia Pencheva 2:11.44……In previous heat Lyudmila Ninova almost died after the finish lane – she fell on the grass breathless and it had the doctot to wait for 5 minutes to restore her to consciousness…. Finally the standings were: 1.Sabine Braun 6442 (NR), Birgit Dressel 6172, Sabine Everts 6167 (that itself apearred also as West German qualification for LA Olympic games), 4.Birgit Clarius 6044, 5.Emilia Pencheva 5993, 6. Marijan Wijsma 5981, 7. Iris Kunster 5968, 8.Annete Tannander 5817, 9. Renate Pfeil 5729, 10.Lilyana Panayotova-Ivanova 5628….14.Lyudmila Ninova 5248 points. Tow weeks later – in Sofia on 16-17 June held Bulgarian Multiple Champs. As expected, the winner was Emilia Kunova-Pencheva with 6050 points (14.22; 1.79; 12.44; 24.88/ 6.24; 38.48; 2:12.62), followed by Valia Vassileva 5663 and third placed Mariana Nakova 5548….. The “Druzhba” junior tournament was held in Plovdiv on 04-05 August. The 17 years old Emilia Dimitrova took sixth place 5465 (14.94; 1.65; 11.67; 25.35/ 5.38; 40.88; 2:21.63). Seventh placed Dimitrichka Shivarova with 5370…In Varna 10 days ago (on 21-22 July) Shivarova won an improvising tournament with 5417 points…. Emilia Pencheva flied to Praha where was held alternate tournament “Druzhba”. She commenced very bad – 14.62 at 100 m hurdles. The troubles continued at HJ (1.70), SP (11.86) and at 200 m (25.51). The trauma at right knee bothered her more than 20 days and…obviously it wasn’t cured in whole. Second day was a little bit better – leap at 5.98 Long jump, and good personal best at Javelin – 39.64…. Finally 800 m were run for 2:17.84. That meant sum of 5718 points and ninth place overall…. The harassed season wasn’t yet over…Forthcoming was Balkaniade in Athina. Emilia Pencheva gained another bronze medal – 5663 points (14.35; 1.70; 11.67; 25.29/5.87; 34.78; 2:17.06) and Valia Vasileva was fifth 5384 points (15.07; 1.67; 11.52; 26.62/ 5.83; 35.88; 2:21.76) …. New faces come on scene, new expectations and hopes knock on door… Maybe this time! Valia Vasileva hurried to prove her quality yet in Götzis on 25-26 May. There she placed 14th with pb of 5654 points (14.72; 1.72; 13.47; 25.57/ 6.01; 34.06; 2:20.28). On the her hand 18 years old Emilia Dimitrova also showed her grow capabilities at all stamina. In Sofia on 15-16 June she accomplished huge pb 5699 (14.56; 1.69; 11.87; 24.86/ 5.89; 40.56; 2:13.58)….On 05-06 July Dimitrova again maintained her best condition – 5908 (5852) points (13.8; 1.70; 12.82; 24.6/ 5.81; 44.14; 2:16.8)…. Individual Multiple Champs held in Sofia on 13-14 July. A battle for the primacy between Valia Vasileva and Yordanka Donkova was sharp and unpredictable to the end. Donkova began confidently (13.24; 1.75; 11.76; 24.22/6.07; 32.46 pb at javelin… But Vasileva was stabile enough – 14.07; 1.75; 13.62; 25.31/ 6.02; 35.96. Before last two events - Javelin & 800 m the advance of Donkova before Vasileva was a good 98 points…. After cut the gap at Javelin, Vasileva was keen to win against her rival at last & decisive 800 m. Valia was urgent and run for 2:18.88 against Donkova’s 2:27.13. Eventually Valia Vasileva grabbed the gold with pb 5797 ahead of Donkova 5733. With bronze remained Ivanka Valkova 5340 points….. In Stara Zagora on 02-03 August was held Balkaniade for men & women. Emilia and Valia were there. At first event – 100 m hurdles the best was Liliana Nastase (Rou) 13.14, followed by her compatriot Coculeana Oltean 13.74, Valia Vasileva 13.92 and Emilia Dimitrova 14.15. At High Jump Oltean (1.77) and Nastase (1.74) were better than Valia Vasileva 1.71. Dimitrova left far below with 1.60. The Shot put was won by Vasileva (13.12), ahead of Oltean (12.48), Dimitrova (12.27) and Nastase (11.68). Lilana Nastase on her hand edged Emilia Dimitrova for the first place at 200 m – 23.90 to 24.34. Fourth was Valia Vasileva – 25.30. Long jump was the first on the second day. Nastase leaped twice exactly at 6.34 before fouling…. Emilia marked 5.97 and Coculeana Oltean 5.84. The real shock became from Valia Vasileva – she took three fouls and…zero points. Emilia Dimitrova was best at Javelin with 42.98, Oltean threw 41.20, Cornelia Nikopoulou (Gre) 40.40 and Valia Vasileva made personal best with near 40 m mark – 39.46 m…Well below completed Liliana Nastase – 35.22. Albeit Liliana Nastase passed through Emilia Dimitrova with closing stages at 800 m – 2:14.82 to 2:14.96. Third finished Georgia Dragokopoulou (Gre) 2:15.06 and fourth Vali Vasileva 2:17.60! Thus Lilana Nastase became Balkan Champion with 6063 ahead of second Romanian Oltean 5845, with bronze remained for Emilia Dimitrova 5778. Valia Vasileva herself stood at the last seventh place with score of 4964 points out from six events…..
Emilia Dimitrova had selected for European Junior Championship in Cottbus. She was not the hot favorite. The very danger rival was soviet Elena Davydova… Emilia commenced in excellent manner – 14.08 at 100 m hurdles and 1.71 at HJ (both pbs), 12.45 and 24.09 (another pb) in first day. Davydova was in fine form also – 14.40 at 100 m h; mighty 1.86 at HJ; 12.15 SP and 25.10 at 200 m. So Davydova led to Emilia Dimitrova with 3526 to 3497 after first day (29 points) The soviet widened his priority after Long Jump (6.34 contra Dimitrova’s pb 6.20). So the distance was 4482 to 4409 (73 points for Soviet)….Emilia almost piped her pb at Javelin – 44.10 (to Davydova’s 42.02) and so Dimitrova cut the advance of Elena to 33 points. The 800 m run became decisive. Emilia Dimitrova gave all of her and finished for personal best of 2:12.77. Thus she destroyed the Davydova’s advance (who run 800 m for 2:17.15) and won gold medal and became European junior champion with NR U20. Emilia defeated Elena Davydova with 28 points (6051)…. The triumph was real surprise for almost everybody, but not for Emilia and her coach Ilian Pishtikov…..Dimitrova demonstrated will and urgency fighting for the victory!!!! At the midsummer the 33 years old sprinter, jumper & all-rounder Ivanka Venkova Todorova (100 m 11.27; 200 m 23.24; 400 m 51.27 NR; LJ 6.63) was invited to replace the ill colleagues and to prepare for European Cup Final in Krefeld. Venkova tried only once Heptathlone – on 17-18 August in Sofia. Her score was not bad – 5262 points (14.38; 1.60; 10.93; 24.92/ 6.00; 26.84; 2:21.84)…So four selected Bulgarians were: captain Valia Vasileva, Emilia Dimitrova, Ivanka Venkova & Ivanka Valkova…..
Second day appeared as poorer for Bulgarian team. Yet at Long Jump in Group A Ivanka Venkova (5.85) and Ivanka Valkova (5.71) couldn’t do anything more. In Group B Valia Vasileva achieved pb with 6.03, and closed only after Heike Tischler (GDR) 6.19. Emilia Dimitrova felt pain in her left heel and recorded only 5.76….. The javelin was also disappointing for Valkova (28.92) and Venkova (27.98) in Group A. In Group B Emilia Dimitrova remained for a full nine meter gap below her best – 35.36. Nor better was appearance of Valia Vasileva – 35.06…Only one event left – the toughest 800 m. All four Bulgarians were set in first heat together with Great Britain’s and Dutch’s….Emilia Dimitrova and Ivanka Venkova made a piece of exploit….They spurted at final stages and took first & second place – 2:14.35 and pb (2:15.01) for 33 years old Ivanka Venkova in her last contest at all. Britain Judy Simpson (2:15.41) finished third and fourth arrived Valia Vasileva (2:16.47). Ivanka Valkova completed the race completely exhausted in 2:23.65… A few minutes later it was discovered that Vasileva has passed too quickly (before the cones after first 100 m) from her own lane in a common lane at second 100 m. So Valia Vasileva was disqualified and her points from 800 m (872) were annulled….. The final standings of Bulgarians shown were as follows: 14. Emilia Dimitrova 5710; 17. Ivanka Venkova 5262; 22. Ivanka Valkova 5113; 23. Valia Vasileva 4932. If Vasileva has had added those 872 p., here score would has been 5804 for a pb. And she should be 13th overall. Bulgarian team placed fifth (16085), only ahead of Netherlands (15728)…. Emilia Dimitrova was among the invited athletes for the “Goodwill Games” held in Moscow on 06-07 July. All contenders were among the best in the world. World record holder Jackie Joyner-Kersee was also there…Emilia begun with personal best – 13.73; 1.76 and 13.46. At 200 m she performed 23.17 (another pb) and was defeated only by Joyner-Kersee (23.00). At Long Jump Dimitrova has been harmed by judges. she recorded 6.29 in first try. Second attempt was perfect – Emilia landed at about 6.50 m!!! But the official pulled the roulette and the measurement was declared as…. 6.25??? Nevertheless Dimitrova threw good javelin (43.30) and fought at 800 m for another pb – 2:09.85. At end Emilia Dimitrova scored 6403 points for sixth place (only 13 point after the fifth Marianna Maslennikova 6416 because of her 2:06.09 at 800 m). Svetla Dimitrova was included in the junior team for the First World Junior Champ in Athina. She was not the hot favorite, and so competed without pressure on her….Svetla commenced with 13.85 at 100 m hurdles (here the better was only Anke Schmidt (GDR) 13.81). Later she struggled at HJ under fury of the sun’s braze at the midday schedule at the stadium. The temperature was more than 35 Grad C – so hot that most of contenders hide under the tents with hats on heads and refreshed faces with cold water……Svetla began causiously with 1.67, passed through 1.70; 173; 1.76; 1.79 (only four girls got that – Svetla, soviet Marina Shcherbina, Finn Tina Rättyä an US Peggy Odita. At the next – 1.82 – only Dimitrova, Beer and Odita succeed… Peggy failed at 1.85, but Svetla continued her marsh to next heights – 1.85, 1.88 before stumbling at 1.91… Those 1.88 would have been enough for Svetla to win bornze medal in main event!!! Next event – Shot putting – was a little bit weak for Svetla – 10.12, compared with Sylvia Tornow’s (FRG) 13.34 and Marina Schcherbina’s 13.01….At 200 m Dimitrova finished second in the last heat with pb of 24.32 (just behind Anke Schmidt (GDR) 23.93)…… Second day commenced with mighty 6.30 of Anke Schmidt & Marina Shcherbina at Long Jump. Svetla leaped another pb – 6.26 m to stay in contact for gold medal. At JT several girl threw over 40 m (the best of them were Marina Shcherbina (47.32) and Australian Louise McPaul (47.18). Dimitrova herself threw in a good (for herself) 37.16 m and waited quietly for the last event – 800 m…In the second heat winner became Jackie Kinsella (Gbr) with 2:11.94. In the last 20 meters Anke Schmidt edged Dimitrova with 9 hundreds of second for second place (2:12.23 to 2:12.29). But that didn’t matter at all. The gold went to Dimitrova! The other favorite – Marina Shcherbina stayed behind with 2:16.40…Thus Svetla Dimitrova (two years younger than her own rivals) became world Heptathlon champion at the inaugural Champ! Bulgarian individual Multiple Champ held at the National Stadium “Vasil Levski” on 02-03 August. Surprisingly the winner was…. Tania Tarkalanova. She exceed 6000 limit by just a single point. Tarkalanova performed pbs in all seven events (!) – 13.33; 1.77; 11.92; 24.96/ 6.39; 39.52; 2:21.05…. Second placed Valia Vasileva with pb of 5844 (13.80; 1.74; 13.74; 25.37/ 6.08; 34.24; 2:16.43). Bronze awarded to Ivanka Valkova 5677 (13.55; 1.74; 10.58; 24.41/ 6.53; 34.72; 2:34.37)…. Emilia Dimitrova prepared hard for European Champ in Stuttgart. The contest lasted on 29-30 August. It was all days raining – the weather was soggy and her injury at right foot prevented her appearance in a while….. Her marks were ot the best – 13.88; 1.71; 13.29. At 200 m Emilia tried to do as fast as she can. And she almost did – First in the last third heat with 23.42, a fraction before Anke Vater-Behmer (GDR) 23.46 and Natalya Shubenkova (URSS) 23.92… Second day began in waste pace – a miserable 6.01 at LJ and 39.39 at JT. At 800 m Emilia was second (behind French Nadine Debois 2:08.52) at the initial heat – 2:10.93 and placed eventually tenth with 6105 points. In second heat Behmer made mighty 2:03.96 ahead of Shubenkova 2:04.40….The East German became European Champion with 6717, followed by Shubenkova 6645 and Judy Simpson (Gbr) 6623…. There was another contest for Emilia Dimitrova – the multiple tournament in Talence on 20-21 September. That was her fifth Heptathlon for 1986. Emilia began with pb at 100 m hurdles – 13.57 (!) and continued with 1.66; 13.67 pb; 23.44/ 6.25; 36.62 and 2:09.47 pb) for score of 6155 points enough fou fourth place (behind pole Malgorzata Nowak 6258, the East German Marion Weser 6196 and US Cindy Greiner 6170….. The pre olympic year began with real misfortune – at FISU indoor meeting Svetla Dimitrova (after achieving at end of January 6.19 LJ & 8.2 60 m h) injured seriously her left knee – ragged meniscus….Young athlete had to postpone desires and ambitions…. The Bulgarian Individual Combined Champs held on 13-14 June. Ivanka Valkova begun with pb at 100 m hurdles – 13.28. After that she continued with 1.73; 10.64; 24.37 to complete the first day with firm lead. Everybody waited anxiously her Long jump at second day…Valkova began with 6.29 and 6.40….. At her third attempt she jeopardized and leaped at around 6.60 m. But the red flag was raised – foul. Ivanka performed pb at Javelin – 38.98 (she used to throw with left arm). At 800 m she couldn’t give something under 2:15 and run instead 2:17.59….So he hold up at the doorstep of 6000 points, scoring pb of 5970 points. Second also with pb ranked 19 years old Yurka Khristova – 5839 (14.16; 1.82; 12.25; 25.22/ 6.05; 39.00; 2:20.12). Third placed long jumper Tsetsa Kancheva 5768 (14.19; 1.61; 12.42; 24.19/ 6.57; 30.40; 2:14.38). Tania Tarkalanova 5590 remained fourth…. So the team was paired and ready for traveling to France. Olympic year was not so lucky for Bulgarian heptathletes. Svetla Dimitrova came back after more than a year and half absence…..
Ivanka Valkova opened the season in Sofia on 21-22 May with 5679 (13.87; 1.75; 10.48; 24.53/ 6.27; 37.32; 2:27.48)…..
Ivanka Valkova was selected for Balkaniade in Ankara on 16-17 July. She ranked there second with good 5584 points, behind Petra Vaideanu (Rou) 6241…..
Karamfilka Petrova flied to Nyiregyhasa for “Druzhba”junior tournament 12-14 August. She began Heptathlon with sleazy 15.12 at 100 m hurdles, after that cleared 1.68 at High Jump, at Shot putting achieved personal best of 13.72. At 200 m Petrova retreated only a hundred to Czech Marcela Podracka – 24.99 to 24.98. At Long Jump Karamfilka made two fouls before marking 5.79 m. Javelin was also weak – 27.32… At 800 m Petrova was second 2:17.44, only after Podracka 2:15.56. Finally Karamfilka Petrova scored 5390 points for sixth place overall…..
Young (18 years old, but twice world champion) Svetla Dimitrova deserved travel to Seoul for participating at XXIV Olympiade. Svetla was no afraid of anybody on the track. The 100 m hurdles began on 23 September. Svetla settled in the ultimate fourth heat. She run bravely and won in a excellent 13.24 (1.2) – NR U20. That ranked her after the great Joyner-Kersee 12.69, Sabine John (GDR) 12.85 and Anke Vater-Behmer 13.20…What a encouraging start! At HJ Svetla reached 1.80 on third try…The shot putting was really weak – only 12.02… At first heat of 200 m Svetla edged for victory with 23.49 (-0.7) ahead of Jane Flemming (Aus) 23.59 and Cindy Greiner (UA) 24.48. So that 23.49 meant third place – only after Joyner-Kersee 22.56 and Anke Behmer 23.10…Second day for Svetla was relatively worse. At Group A of Long Jump she leaped to 6.18 and 6.19. Dimitrova jeopardized all in third attempts. And landed at 6.40 m!! But – for regret it was foul! The sixth event – Javelin - was not so happy for Dimitrova. She began with 37.62, and instead of improving, she weakened – 35.14 & 33.90. Young athlete was confused before 800 run. She has scheduled in second heat. For Svetla there was nothing to loose. With 2:15.73 Svetla remained fourth in that heat, behind the winner Marjan Wijsma (Ned) 2:11.49, Soviet Svetlana Bouraga 2:14.74 and Suisse Corinne Schneider 2:14.93…With sum of 6171 (her third ever) Svetla Dimitrova ranked 12th in that amazing contest!! !